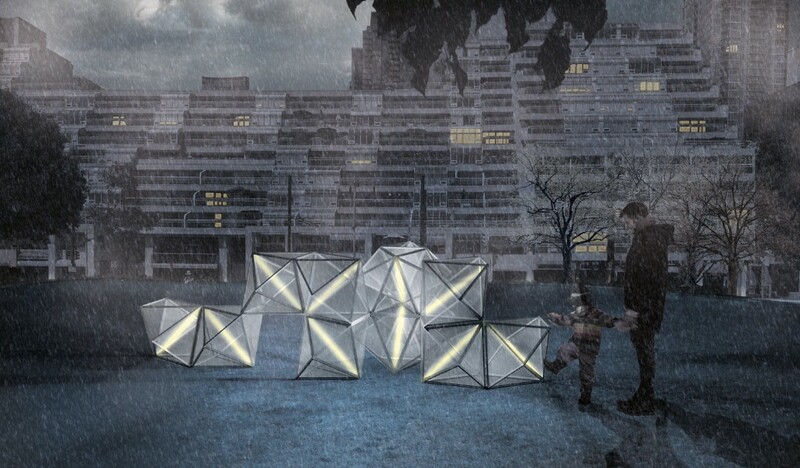 Three-dimensional, faceted hands standing three metres high; glowing, modular boxes from Denmark; and oversized, camouflaged massing models will each mark Toronto’s Waterfront in January as part of a brand new public art exhibition entitled Ice Breakers. A collaboration between The WBIA and the founders of Winter Stations – the popular, annual art competition held along Toronto’s East End Beaches – Ice Breakers was conceived to inspire exploration of the urban Waterfront in the colder months. Whereas Winter Stations is a response to the open vistas of Ashbridges Bay and Kew Beach, Ice Breakers takes its cues from the commercial history of the harbour. The name Ice Breakers is inspired by the utilitarian ships once used in Toronto’s harbour to break up frozen bodies of water, keeping commerce flowing into and out of the City. The name is also a testament to the power of design, bringing strangers together and sparking dialogue. Developed in partnership with PortsToronto and Waterfront Toronto, all five Ice Breakers installations will be dispersed throughout the Waterfront between Yonge St. and Bathurst St. beginning January 21. The exhibition will run over five weeks, coinciding with the debut of the third annual Winter Stations Competition in The Beaches on Family Day. 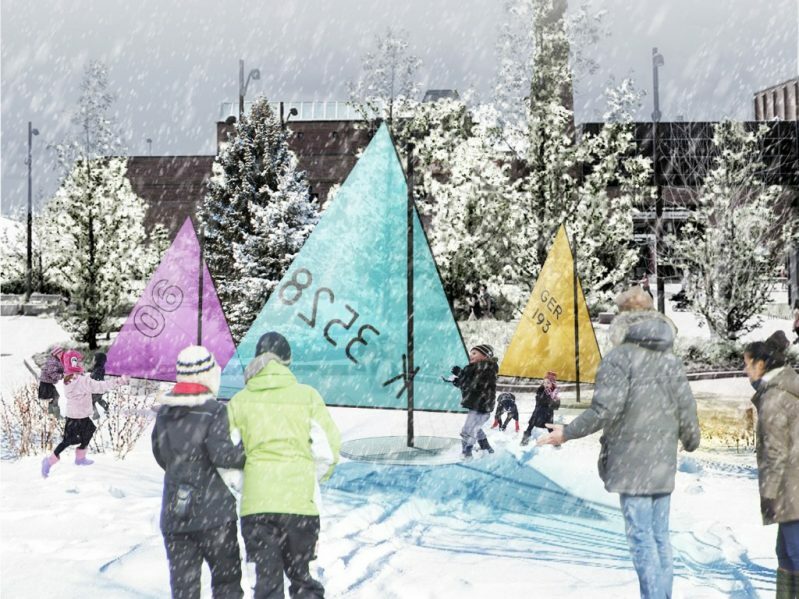 Ice Breakers will see design contributions from all three founders of Winter Stations: architect firm RAW, landscape architects Ferris + Associates and public art consultancy Curio. Toronto-based design team, and original Winter Stations contributor, Polymetis, will also be participating, with Denmark design studio Platant rounding out the group. Celebrating Toronto’s richharbour history, design studio RAW introduces three pivoting structures to Canada Square. Inspired by ice and sailboat technology, enamel masts hold up brightly coloured sails, each of which serve as sculptural references to the days prior to ferry transportation. The Canadian winter is a landscape of contrasts: between empty blank whiteness and things not fully shrouded in snow and ice; between the (more-or-less) static physical world and the temporal surfaces of frozen water that accumulate and dissipate over it; between being inside, in the warmth, and being outside, in the cold. ‘ICEBOX’ seeks to manifest these contrasts and provide space for introspection, social interaction, and shared appreciation of winter. The shimmering lights emitted from ‘White Diamonds’ attract contemplation of these fragile, yet solid structures. The viewer is invited to engage with a poetic and dreamy focal point, in a vast winter landscape. Using architectural massing models as the inspiration for the structures, ‘Incognito’ explores what happens when you make the City’s architectural interventions invisible. Adopting the same camouflaging technology used by warships, the wintery environment will render the installation truly incognito, shaping the public’s interaction with the piece. A set of faceted wooden hands rise three metres from the lookouts at the Peter Street Basin. Their gold-mirror palms bath the basin in a warm sun-like glow.